Jean-Paul Poletti, the renowned Corsican singer and composer got his initial training in music from Vincent Orsini. He moved to Italy and stayed there till 1970, where he diligently studied counterpoint classes and harmony at the famous chorus school of Cantarum in Florence and Sienna. Back in Corsica, he played a key role in the RIACQUISTU (reclamation of the Corsican Culture). This led to the birth of the iconic group CANTA U POPULU CORSU along with Petru Guelfucci and Minicale. During their association of seven years -1974 to 1981 — they created 9 albums and held numerous concerts. Jean Paul Poletti formed The Men’s Choir of Sartene in 1995. 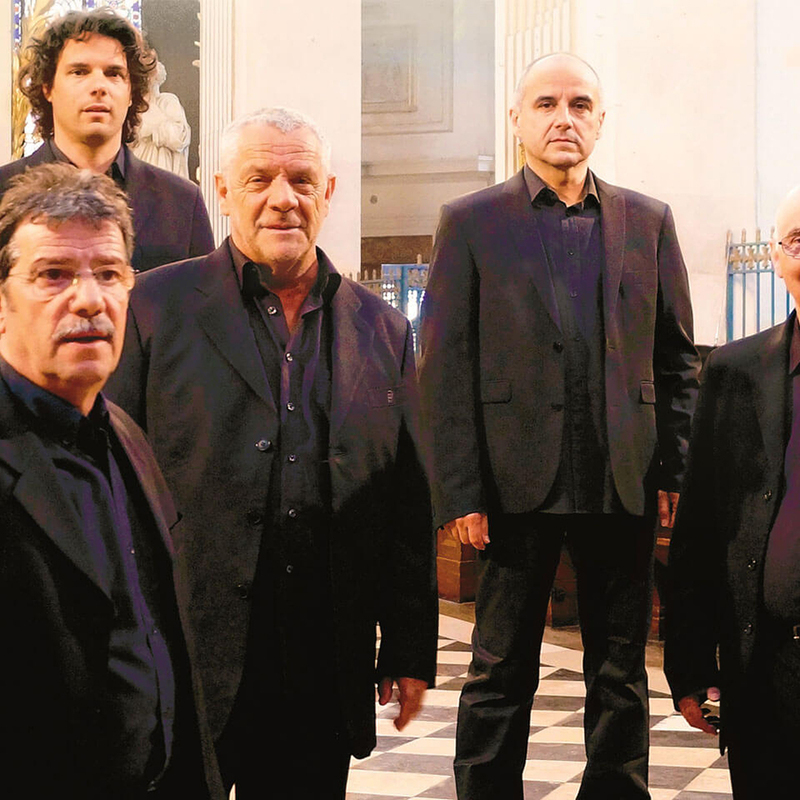 The group consists of 6 men: the group is constantly inventing musical spaces nourished by the classical past but with a contemporary inspiration. In the musical universe, the Corsica choir takes an atypical place with all its classically trained singers giving a fresh sound to the traditional polyphony. Always in a search, this group is constantly exploring new musical forms. Men’s Choir oscillates between the popular and sacred attempting to convey a strong emotion, a sense of the Corsican soul and the mysteries of the island, in short what is invisible to the eye. They have been performing worldwide including in Mexico, China, Korea, United States, Austria, Belgium, Russia and Africa. Jean Louis Blaineau a composer, arranger, singer and cellist belongs to a family of musicians. He started his musical career in 1979 but has been associated with the Men’s Choir since July 2000. Jacques Tramoni is from a family of singers. He was initiated into Gregorian chants at a very young age by Father Ulrich, a Franciscan monk of the monastery of SartÃ¨ne. He was a natural choice as a deep bass when the Singing School of SartÃ¨ne was created in 1987 by Jean-Paul. Jean Claude Tramoni is the younger brother of Jacques. With his `low and traditional voice’ he is the perfect choice to be the soloist of the Men’s Choir of Sartene. This great connoisseur of “paghjelle” and Corsican song, he is always available to pass on his knowledge to younger generations with great humility. Stephane Paganelli, got interested in music when aged 11, his parents bought him his first drums. He became a student of opera singing class of Anne Marie Grisoni conservatory of Bastia. It was only in year 2000 that he was called to join the Men’s Choir. He went on to become one of the leading soloists of the group especially the oratorio Stabat Mater.